The Old Baldy Civil War Round Table of Philadelphia held its July 11th meeting at the Camden County College. Harry Jenkins prepared a great presentation on military drummers, “Forever In Our Hearts He Dwells,” about the lives and legends of drummer boys in the Civil War. 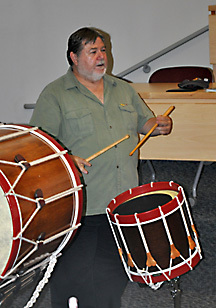 Harry also included demonstrations of drumming techniques and the music played by Civil War musicians. Harry discussed the reasons for drummers in the Civil War, the sounds and the techniques of drumming, and how orders were relayed to the troops by the officers during combat and camp life. He relayed several stories of drummers: how young some were, how brave these drummers were during combat, being right in the middle of the fighting. Some of the brave acts that were beyond their role as drummers. One interesting story of a drummer who risked his life to retrieve President Nixon’s wounded grandfather from the field of fire. He later received the Medal of Honor. Harry always gives us an interesting and educational presentation. When Harry was eight, his dad took their family on a trip to Gettysburg. That trip was his introduction to the Civil War. Like many of us, he has been back to Gettysburg so many times since that he can’t count them all, and he knows his way around the town and the battlefield like he knows the back of his hand. Along with this, he continued to follow his Civil War interests, first as a drummer boy at the age of 14 during the Civil War Centennial celebrations in the early 1960’s. Having attended college near Phoenix, Arizona, and eventually moving there, he returned to the Philadelphia area in 1987. It was then that Harry decided to rejoin the ranks of Civil War reenacting, but this time as a soldier instead of a drummer boy. But he never lost his love for the drum, and continues to play even now in reenactments and parades. Harry is a long-time member of the Old Baldy Civil War Round Table of Philadelphia, and a member and supporter of The Friends of Gettysburg Foundation, the Gettysburg Battlefield Preservation Association, and the Civil War Preservation Trust. Born and raised in Philadelphia, Harry pursued his education in Architecture at Temple University and Arizona State University. He spent many years as a Project Manager, managing the planning, design and construction of many schools, medical facilities, and government facilities throughout eastern Pennsylvania, New Jersey, and New York. He now resides in Newark, Delaware, with wife Bobbie, and is very proud of son Clayton, a 2007 graduate of George Washington University, who is also a drummer. This entry was posted in Meeting archive on July 11, 2012 by hlj.